My new favorite city is Portland, Oregon. I was there talking up my book (have you heard of it? ahem. I digress…) and was constantly taken aback by the beauty of the city – surely they ordered the sunshine and flowering trees especially for my visit! (Oh, a girl can dream!) I think the thing that swept my heart away was how environmentally and civically minded the city as a whole is. The citizens are proud of the intense conservation practiced in their city- there are no strip malls in the central city and outlying neighborhoods- no Targets, nothing but lovely little neighborhoods anchored by shopping streets. On these streets you’ll find coffee shops, restaurants with some of the best chefs in the country happily cooking away, wonderful unique shops offering a world of artisanal wonders … Portland, where have you BEEN all my life? So I was wandering through one of the neighborhoods and I saw an amazing thing – a beautiful little series of bioswales, built on the parkways. Not every parkway planting strip had a bioswale on it, but there were enough of them that they formed a wonderful visual throughline on the block, as well as performing a valuable function. looks so good, and is so good FOR you! 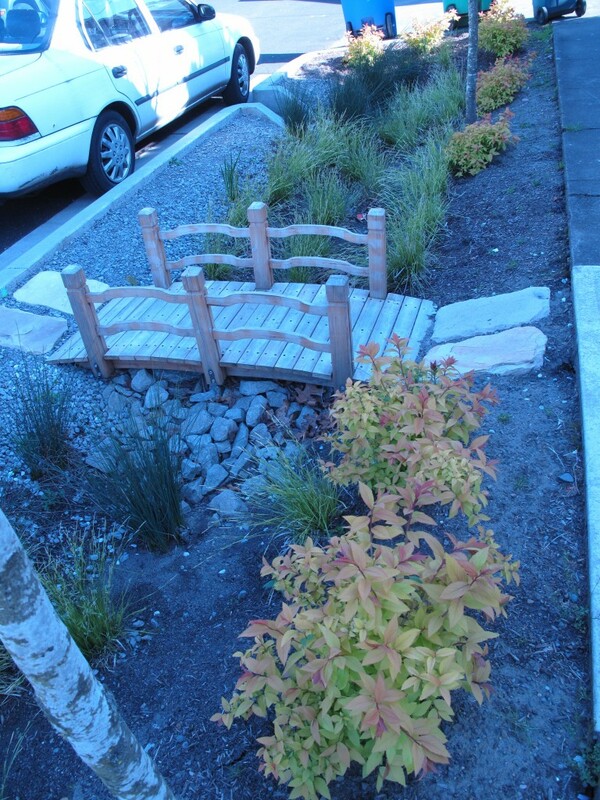 A bioswale is a stormwater conveyance system. The idea is to direct the water runoff from impermeable areas, like parking walks, sidewalks, and streets, into the bioswale (or as it was formerly known in the “olden days” – the ditch) and keep it there, moving between stones of different sizes and vegetation so that impurities are filtered out before the water hits the storm drain. The swale needs a gentle slope, rocks, and plants. Easy! They can meander, they can be straight – they just have to keep the water percolating through the swale- the job of the rocks and the plant is to slow the flow of the water so the filtering process can happen. In a rainy climate like the one they have in the Pacific Northwest, the benefits of a bioswale are obvious – the polluted run-off from streets and parking lots can be filtered before it is dumped into the storm drains and subsequently into the Wilamette river, and they are wonderful ornamental features that turn what could be a waste of space into something beautiful. slope, rocks, and plants - a recipe for a good, active ditch! 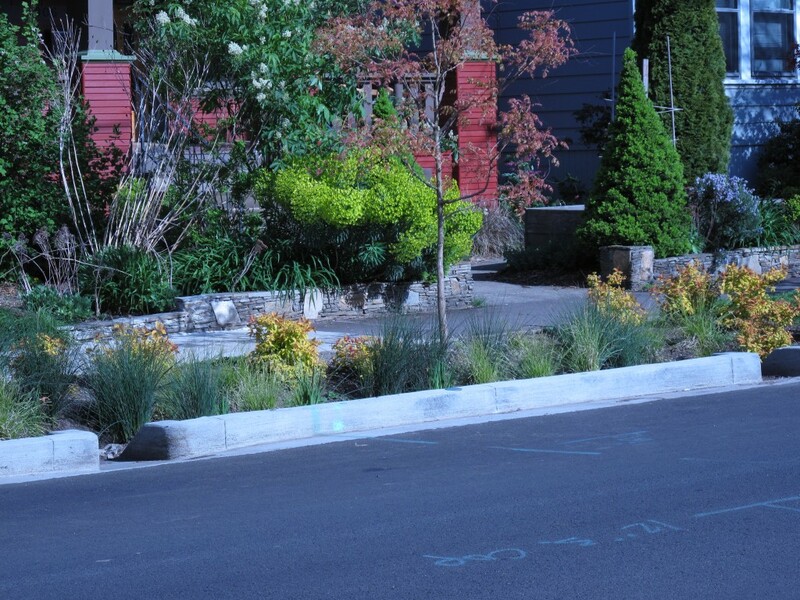 Portland has a huge bioswale situation going on – you see them all over the city, and I hear they are planning more. The parkway strips (okay -HELLSTRIPS) of our fair land are sorely in need of attention, and Portland is leading the charge to turn them into productive rain-gardens. While I like planting food in MY hellstrip, I think this is a fantastic use of that no-man’s-land. Many of the bioswales in Portland were done by the city and industrial planners, but this one seems to have been done by the citizens of this little street. I was so enchanted. Every bioswale was slightly different, which added to the experience – the design throughline was carried out, but slightly shifted every time you saw it. Fantastic. this super cute girl lived on the street - she wasn't making a bioswale, but I'll forgive her! one of the swales have a tiny footbridge! adorable!!! Everywhere I went in Portland, I saw things that attest to the fact that people there care about their communities, their city, and their world. People are crazy about gardening, they bike everywhere, they are protective of their open space and are justifiably suspicious of developers who would take the character of the city and change it. Don’t go changin’ Portland! I love you JUST the way you are! Do you live in a rainy climate? 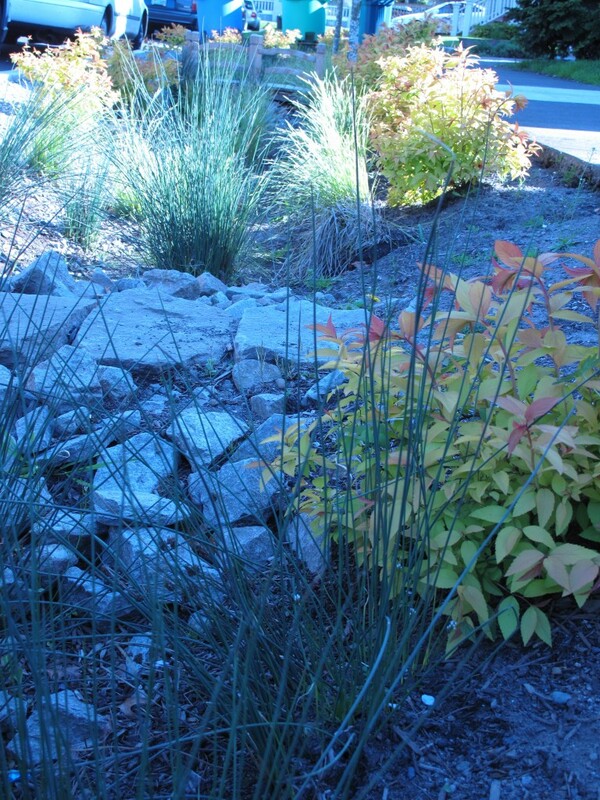 Why not consider creating your own bioswale/rain garden? I LOVE this so much. I am having an imaginary love affair with Portland (but haven’t been since I was 5.) The bio-swale can be adapted well in Southern California too though, in insisting that roofwater wsh through landscape rather than going straight to the street (sometimes you have to talk your contractor into this crazy idea…..and of course using permeable surfaces wherever possible! Thank you so much for showing how beautiful it is there. Sigh. Goal, a little Portland in LA. Wonderful share, if we could get City’s to adopt these practices when approving new building plans and restoration life would be so much better! Great job of explaining bioswales in layman’s terms. This is the current standard for stormwater treatment in much of the country & a big piece of our business these days. They take a very particular soil mix with just enough porosity to let the water flow through, but not so much as to be to dry for the plants. You will see bioswales in most new construction or recent renovations of streetscapes or commercial properties in CA. Definitely a big improvement over the past 30 years of seeing how fast we can get rid of the water, never mind what its taking with it. Kudos to Portland! Thanks for noticing and writing about our wonderful city. The creative water diversions are popping up all over town with rain barrels, dry stream beds and the Swales… So much rain it’s nice to have such creativity with managing it! Laura – you and me BOTH! Going to Portland was like going to a magical fairy tale city for me! I’ve seen some good examples of bioswales here in LA, but most of them are on private property rather than out in the public parts of our city. We need to take a cue from our rainier, fairer sister city to the north! Portland, LA is winking at you! I’d love to see more bioswales in public here in Los Angeles. The north is so much more progressive! XO! I look forward to every new post. Although I can’t apply some of the info to our Phoenix climate I enjoy reading your design ideas. The new issue of Sunset magazine arrived over the weekend. Congrats on your article. I have never heard of a bioswale before I read your post. I love the idea. It is green and it is functional. We are tired of grass in our parking strip and we were looking for some ideas. I think we have found the answer for our strip too. I lived in Central Oregon for about 35 years. Loved it. Can’t beat that crisp Northwest Air in the morning. I love this idea of what to do with all the extra rain water. I live in Florida now and think I can use this idea. I absolutely love the little bridge design. Clever and whimsical the wavey boards of the bridge. Great post, Ivette. The gardens are as beautiful as they are functional. It’s very cool that Portland turned their infamous wet weather into another positive attribute of the city. Nice! What a fantastic idea and I hope Raleigh, NC is watching as we’re reasonably rainy, too. In the meantime, will resist the urge to move to Portland! Hi Ivette, thanks for the positive publicity of our city’s right-of-way stormwater management approach. 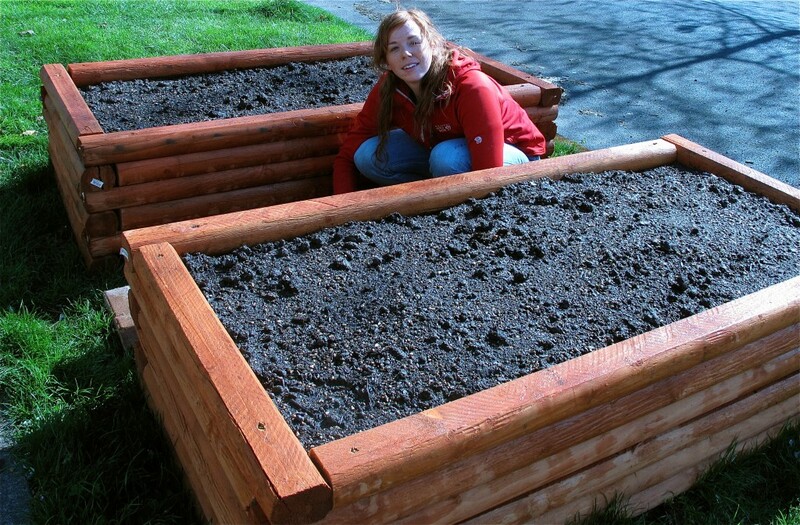 In Portland, we have already built and are managing over 800 bioswales & raingardens or varying sizes and shapes. The project you’re referring to here is the first installation of what’s being called Tabor-to-River, an effort you can learn more about on the City of Portland’s website: http://www.portlandonline.com. I want to let you know that even though we do have some helpful, supportive, and involved neighbors in the project area, and indeed throughout Portland, the City built and maintains the “Greenstreets” in perpetuity (that’s my job!). 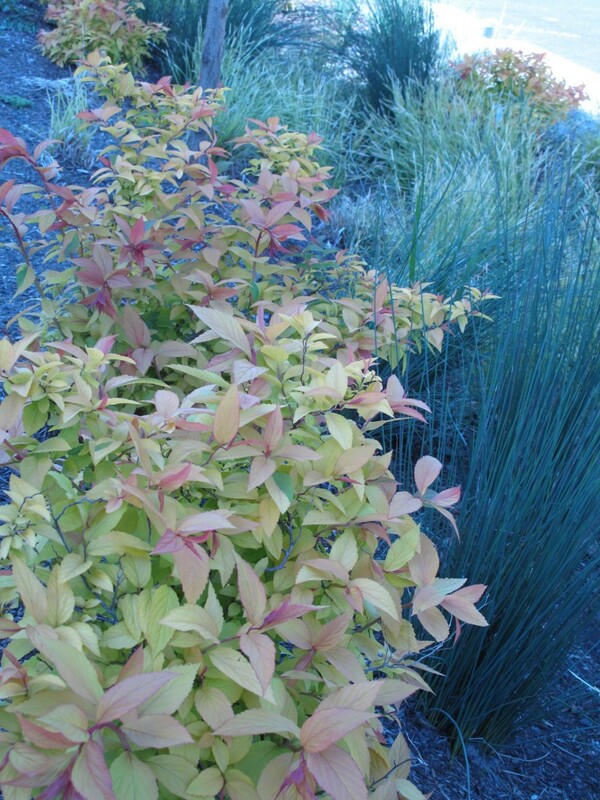 The workhorse plants in this design are a mix of functional ornamentals and adaptable Northwest natives, including ‘Gold Flame’ Spiraea, ‘Magic Carpet’ Spiraea, Juncus patens (Grooved Rush) and Carex densa (Dense Sedge). For anyone interested in learning more about these efforts, the City sponsors bicycle tours of Greenstreets, raingardens, ecoroofs, and permeable paving projects throughout the city several times a year. We would love to see you on one! Thank you so much for commenting, Laura! This is SO exciting and inspiring, and shows what an AMAZING, forward – thinking city Portland is! I am so impressed with the work you do – I was CONVINCED that is was the work of the neighbors, because the choices, while being very focused, was also quite idiosyncratic! There were moments that seemed specific to the house they were associated with. How fantastic – kudos! I would LOVE to go on one of your tours… maybe next time I am in my new favorite city! All the best!